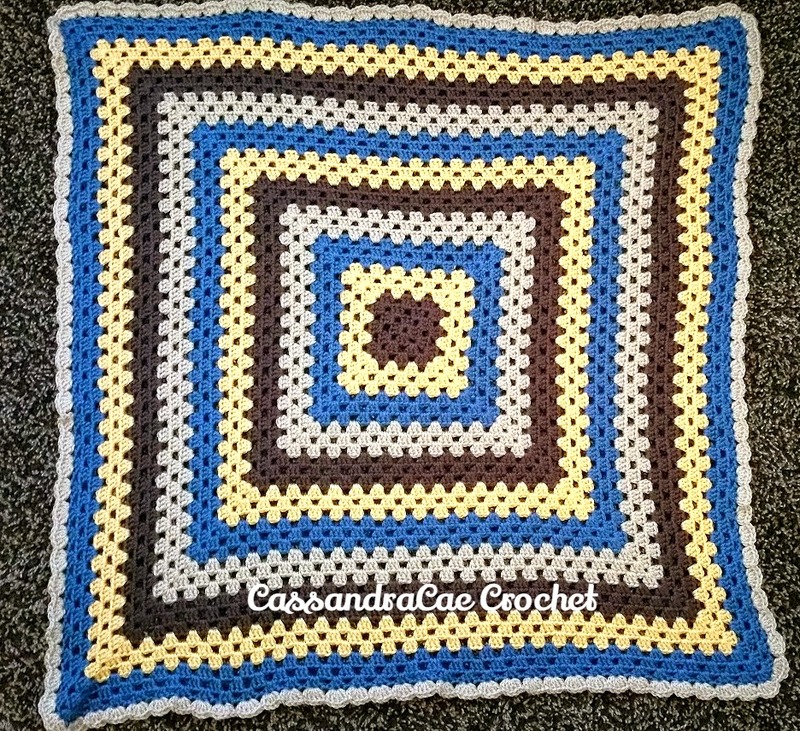 I know I have not been adding to my blog as of late and I apologize for that, I have not had a lot of time for crafting as of late but I did want to take a few moments and share this baby blanket I made recently and also share with you how to make one of your own. This is a really easy blanket to whip together as it is just made of one giant granny square. 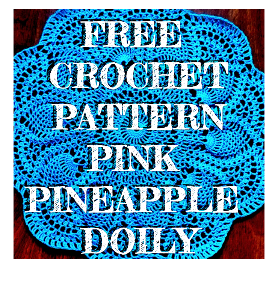 I would make one of these large enough for an adult but I have found that the large you crochet a single granny square the more likely it is to lose some of it's shape. That being said I expanded this particular square to 33 rounds to as to make a decent size baby blanket for a member of my family that is having a little boy soon. I used Caron Simply Soft yarn for this blanket, It is one of my favorite yarns to work with because of how shiny and soft it is. The colors do really just pop. The colors I used were Taupe, Medium Country Blue , Sunshine , and Bone . I used one skein of each of the yarns and still a bit of each left over. After I finished up the blanket I decided to add an edge to the blanket as to give it more of a defined shape. 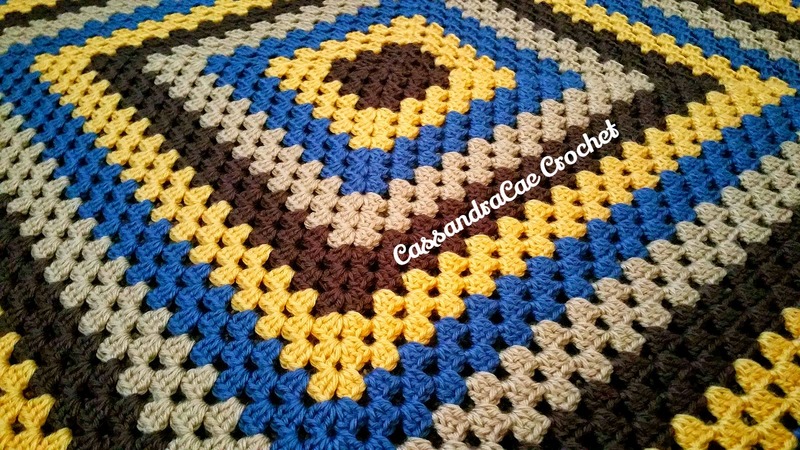 This was pretty simple and it really adds a nice decorative touch to the blanket. With a granny square you have your groupings of three stitches and your gaps. Starting at any of the groupings of three stitches, place a standing double crochet in the middle of the three stitch grouping, this counts as the first double crochet. Then place four more double crochets in that same stitch. In easier terms, place a 5 stitch double crochet shell in the second stitch of each three stitch group. Do not work a stitch in the space, skip it and move on to the next grouping. Continue until you reach the corner of the blanket. When you reach a corner, place one single crochet in the corner and then continue with the shells as you did before hand. This will create a nice and tight edge that does not bunch. This is the finished blanket. As you can see it does start to lose a little shape as the square grows so I would not go much larger than 33 to 36 rows but I am very happy with how this blanket turned out and I know it is going to make the new mommy and her little boy very happy. 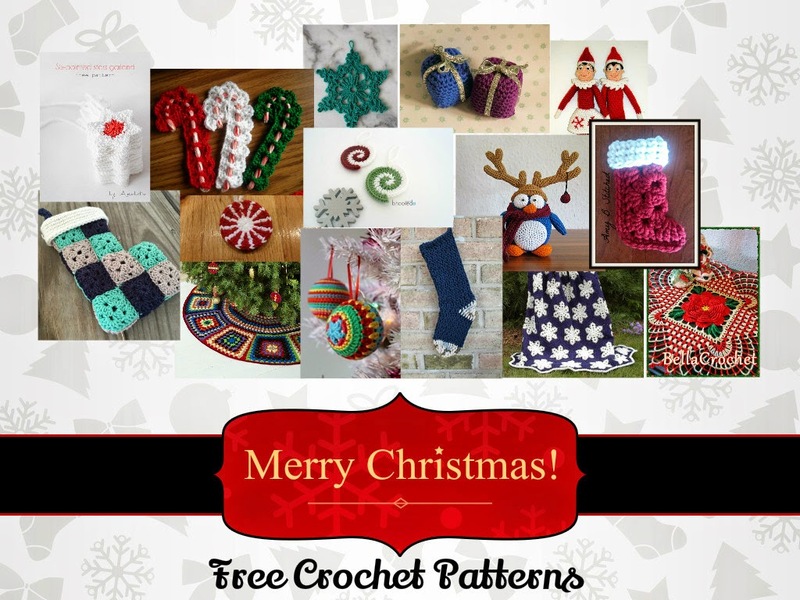 Presentation always adds something special to your homemade crochet gifts. t is always good to write these down for whomever you are giving a crocheted gift to as if you tell them they may forget. Every yarn has different instructions so it is best to pass those on to whomever may be receiving your handcrafted gift. Have you made anything recently for anyone this spring? What's on your hook right now? 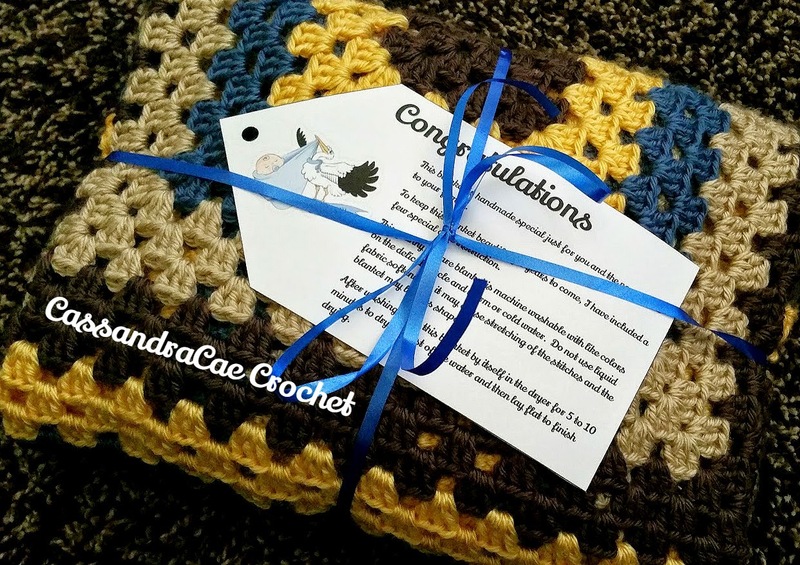 Let me know in the comments and thanks for stopping by to check out this beautiful baby blanket.